Charlotte, NC (May 3, 2018): David Weekley Homes, the nation’s largest privately-held home builder, is now offering townhome floor plans in the Charlotte community of Eden Hall – Garden Collection, priced from the $370s. These one-story, attached townhomes with rear-loading garages are located in Matthews and range from 1,700 to 1,900 square feet. A total of seven move-in ready, or ready soon, showcase townhomes are available for sale. Three will be ready for immediate move-in this fall and four additional townhomes more will be open for sales in early 2019. The floor plans will include The Davidson, which features an owner’s retreat overlooking linear gardens, an extra bedroom and full bathroom, study and open-concept entertaining spaces, including the kitchen, dining and family room. The floor plan also includes a covered porch and two-car tandem garage. The Bradshaw floor plan will also feature open-concept entertaining spaces. Two bedrooms, including the owner’s retreat, are tucked away at the front of the home. This home will also showcase a side entry into the family room, allowing for more natural light to flow into these spaces and a two car garage. The Adelman will feature two bedrooms on the front of the home – the owner’s retreat and a secondary bedroom and bath overlooking the linear gardens. The kitchen is open to the study, dining area and family room. The rear of the home features a covered porch and two-car garage. Amenities in Eden Hall – Garden Collection include access to a gazebo overlooking a lake, fishing dock, fire pit and Four Mile Creek Greenway – Matthews, an asphalt trail with a boardwalk that connects to downtown Matthews. 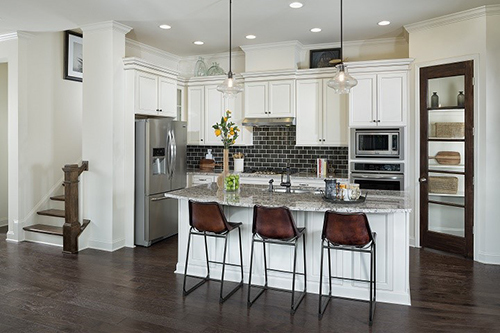 For more information about David Weekley Homes in Eden Hall – Garden Collection, contact 704-972-4254. David Weekley Homes is bringing single-family townhomes to Eden Hall – Garden Collection.